The risks are greater the younger you start and the more often you tan. Indoor tanning before age 35 increases your risk of developing melanoma by nearly 60 percent, according to a 2012 study. A recent study published in the Journal of the American Academy of Dermatology determined banning minors from using tanning beds could prevent almost ~62,000 cases of melanoma, 6,700 melanoma deaths, and $343 million in treatment costs. 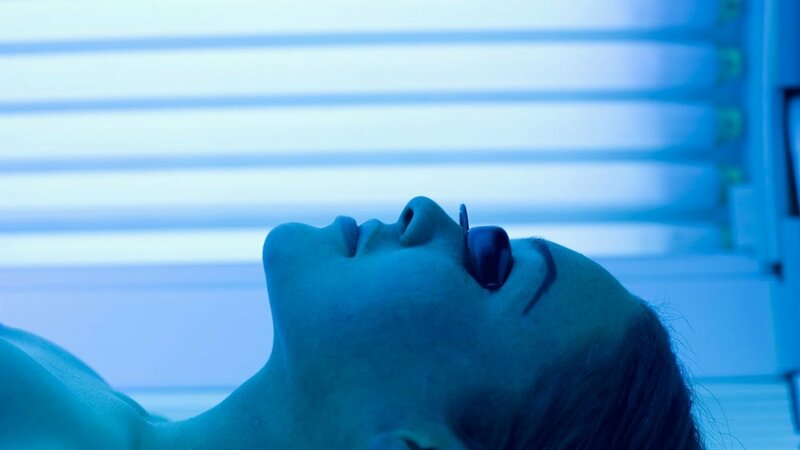 A total ban on indoor tanning could prevent nearly 203,000 melanoma cases and 23,000 melanoma deaths, and save $1.1 billion in melanoma treatment costs. Dear Amy: My cousin is like a brother to me. We have been extremely close our whole lives. My cousin has always thought he looked better with a tan, so he has been using tanning beds for years, despite knowing the risks. Last month, he was diagnosed with skin cancer on his back, and he had two surgeries to remove the cancer. In spite of all of this, he continues to go to the tanning salon. Others and I have begged him to quit, to no avail. He admits that he is "addicted." I lost my first spouse to cancer, and it is killing me to think that my cousin has prioritized vanity over his own health and the concerns of those who love him. Is there anything more I can/should do? Dear One Loss: My research on this topic led to helpful information posted on www.skincancer.org. According to a study published in the Journal of the American Medical Association, the number of skin cancer cases due to tanning is higher than the number of lung cancer cases due to smoking. In the U.S. alone, 419,254 cases of skin cancer can be attributed to indoor tanning. Out of this number, 6,199 are melanoma. Tanning beds are known carcinogens. Two research papers I read also suggest that tanning can be addictive. But — your cousin knows this. His behavior can be compared to a smoker who is unable to quit. Because he has admitted his addiction to you, you may be able to urge him into treatment. Find a local therapist with experience dealing with addictions and offer to go with your cousin to his first appointment. Dear Amy: I'm a 26-year-old graduate student, and I have been dating my boyfriend for six years (living together for three). My boyfriend and I have few common interests. His only hobbies are working out and watching sports. I have hobbies and am naturally a curious person. But when I try to foster intellectual conversations with my boyfriend, I am met with apathy. I am starting to realize how important it is to me to be with someone who can push me intellectually. I want to grow as a person both in my professional life and personal/social life. I wonder if I am asking too much, or if this is a matter of me not trying hard enough to engage my boyfriend. I am not perfect, and perhaps it is my fault for not expressing this need early on in our relationship. I wonder if this is a case of me simply seeking "greener grass"? Are most relationships boring? Should I not expect to have lively discussions with my better half? Would I be better off struggling financially by myself in order to have a chance at a better relationship? Ending things would be the most difficult thing for me to do. I love him. He is nice. Should I simply accept the good and ignore the not-so-good? Dear Looking: Any person in a long-term love or family relationship would do well to accept the good and ignore the not-so-good. Unfortunately, life doesn't seem to work that way. We all want (and have a right to try to find) a relationship that is stimulating and fulfilling. You should work hard to make your relationship as fulfilling as possible. But no — your love relationship should not be boring (to you). Leaving a relationship is extremely painful. You should be brave enough to talk to your guy about this without blaming him for being himself. Many people with one foot out the door can only get the courage to leave after they have found another romantic partner. Don't do that. Dear Amy: Readers criticize people who send invitations to baby showers, graduations, etc. to far-flung relatives as "gift grabs." I am one who sends an invitation to baby showers, birthdays, baptisms, etc. to every member in my family. The entire reason is to make sure they feel included in family events, not for them to give me or my children a gift. It's a great way to update my family members who are not on social media with what is happening in my family's life. I have never faulted out-of-town family members or distant relatives for not sending a present or making an appearance. But I would definitely feel bad if they felt like I was excluding them from a big milestone.